For more information about this event, please contact Bitume Québec at contact@bitumequebec.ca. 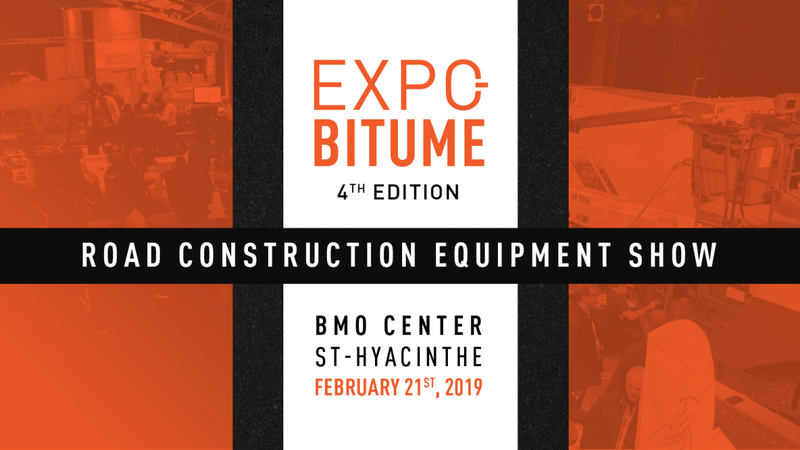 Bitume Québec is happy to invite you to its 4th edition of Expo-Bitume, one of the largest road construction equipment show! Held on February 21st at the BMO Center in St-Hyacinthe, the event will reunite all the big names in the industry. It's a show not to miss! As of all the previous editions, Bitume Québec will offer participants a dynamic exposition that will allow a direct contact between suppliers, users and the different actors of the road building industry in Quebec. As well on that day, conferences on multiple subjects will be held and will allow an increase in visitors. More specifically, during these pratical workshops dedicated to the municipalities, the exhibitors will have a chance to speak to decision-makers of the industry. The parking is free and has 1000 spaces distributed around the different buildings.